Wales are still considering who to bring into their World Cup squad as a replacement back instead of Liam Williams. 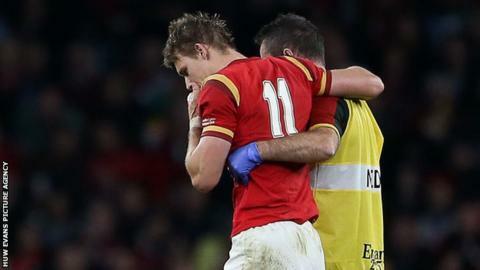 Scarlets' Williams, 24, is out of the competition because of a foot injury he suffered in the defeat to Australia. Forwards coach Robin McBryde said Wales' coaching team were deliberating over who to call-up ahead of Saturday's quarter-final against South Africa. "There's a discussion on who the best candidate would be," McBryde said. Wing or full-back Williams, 24, left the field in the closing stages of Wales' 15-6 Pool A defeat by Australia and will play no further part in the World Cup. McBryde confirmed flanker Dan Lydiate and prop Gethin Jenkins would be available to face South Africa after both missed the Australia game with minor knocks. Wales beat South Africa for the first time in 15 years in Cardiff in November 2014, after losing the second summer Test in Nelspruit in the last minute. McBryde says discipline will be key if Wales are to beat the Springboks for only the third time in their history and secure a semi-final spot. "In the autumn, I'm not being disrespectful but they weren't at their strongest, fielding a side that wasn't the side we're used to seeing," McBryde added. "They're going to be a different challenge this week." South Africa are expected to have veteran Victor Matfield back fit for the game at Twickenham, but the younger pairing of Lood de Jager and Eben Etzebeth have impressed during his absence. "There are some familiar names coming back into fitness, they've definitely got strength in depth" said McBryde. "The experience Matfield's got but the other two have posed a question for the coaches."